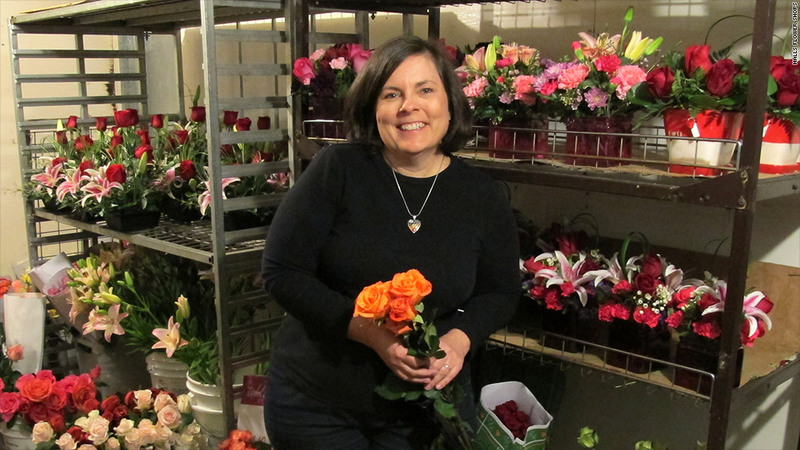 Florists like Betsy Hall, just outside Atlanta, Ga., say they lose money and customers overpay when people use big e-commerce groups like FTD, 1-800-Flowers and Teleflora. Some flower shop owners hate Valentine's Day, losing money on big orders that flow in from big e-commerce groups like FTD, 1-800-Flowers and Teleflora. Take, for instance, an FTD offer advertised last week: a glass vase of roses and mini-carnations for $44.99. To send the bouquet to Reno on Valentine's Day, FTD's service charge bumps the price up to about $65. Adding up $10 in raw material costs, $26 in overhead and $13 for delivery, he would need to make $49 to break even. In actuality, though, he'd have to pay at least 27% in network fees and only make $47 on the order. Taking the order means taking a $2 loss. "If all orders came in this way, our business would not be sustainable," Fiannaca said. Ordering the same bouquet directly from Fiannaca's shop would cost only $53, and Fiannaca would net a $4 profit instead. Shop owners can reject orders or ask for higher prices. But shops say rejecting orders carries its own fee, sometimes $10 to $100. And haggling up prices requires time they don't have when they're flooded with orders. So why do small flower shops participate in these networks? Some see an opportunity to get new customers who otherwise wouldn't know about them. Teleflora assured its company provides florists "with orders and services to grow their business profitably and sustainably." Mark Nance, president of the florist network at 1-800-Flowers (FLWS), issued a statement saying, "We want their business to flourish. Their success is our success." FTD defended its pricing plan, saying it is structured so that florists do make a profit. "Without the significant marketing and technology support from FTD and other wire services, local florists would long ago have faced significant pressures from the same kinds of powerful mass merchants that have already consolidated industries like grocery, hardware, drugstores and merchandise," FTD said in a statement. "Half the florists don't realize they're losing money with this stuff," said Steve Juiffre, a florist in South Burlington, Vt. who is part of the trade group. David Rohr, a florist in Cathedral City, Calif., knew right off the bat. He quit Teleflora after Valentine's Day in 2002, when he lost more than $2,000 that day as business costs and network fees overtook his revenue from delivery orders. "I was able to get new customers. But you can't make any money. They make all the money," Rohr said. "It's insane to see how much money I owe them," she said. "I'm paying close to $600 just to use the service, and I'm actually losing money at this point." What's most bothersome to Betsy Hall, a florist just outside Atlanta, Ga., is what happens to customers. Hall said photographs on major e-commerce websites are misleading and noted that bouquets looked fuller than they would in reality. She also said customers who use e-commerce sites pay more and receive less than if they'd simply contact the local florist in the city where they'd want the flowers delivered. "They take such a huge cut. The money you spend isn't in flowers," she said. "You spend $70 on a $26 bouquet."